I made it to Leicestershire Records Office and had a look at the prescriptions books of W T Hind, chemist and druggist on Queens Road for over 100 years. I wrote an article about W T Hind here. The office holds the prescription books from between 1894 (so not long after Mr Hind opened for business in 1888) and 1954. They are beautiful, card and leather-bound ledgers in a variety of styles. I looked mostly at the volumes covering 1894-1920. The handwriting was difficult to decipher and the prescriptions were in note form, using archaic terms for obsolete medicines, so it was quite a task to make sense of them. The prescriptions were interesting from two points of view: Firstly, the prescriptions themselves; and secondly the people for whom the prescriptions were intended. These varied from those not important enough to be named – many servants like “The Maid (Rev Forsyth)” who needed an expectorant “when the cough gives trouble.” She was prescribed Terebene on a piece of sugar. Also “Baby Baker” (who needed lanolin), “Mrs Rattenbury’s baby” (who turned out to be Grace, daughter of the Wesleyan minister John Ernest Rattenbury, one of the outstanding preachers of his day, then living in North Avenue. He founded the Belgrave Hall mission and built Clarendon Park Church) and countless others. Mr Hind seems to have dispensed to quite a clerical crowd as there were lots of Reverend gentlemen amongst his clientele, eg Rev Holmes (could have been the vicar of St Peter’s or the curate of St Nicholas…anyway, he was a bit bunged up and needed oil of eucalyptus in a tumbler of steamy water) and Rev Forsyth (the renowned theologian and first minister of Clarendon Park Congregational Church). But the prescriptions are fascinating. W T Hind dispensed the medicine of his day and until well into the 20th century much of it was rough and ready, some of it being quackery and much of it being downright dangerous. Take Mr T Pochin’s prescription: Chloroform, strychnine and digitalis three times a day. It must have been a heart medicine, but it didn’t save the poor chap as he died the same year, aged 58. Mr Alfred Edwin Dexter – a commercial clerk living at 51 Howard Road – was prescribed magnesium carbonate, magnesium sulphate, chloroform and aqua…I’d love to know what that was for. 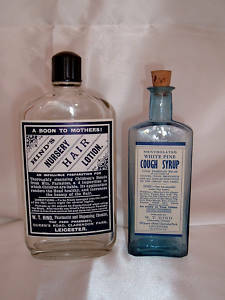 Mr Hind also made up his own “branded” medicines, which all pharmacists offered in the days when medicines were not heavily regulated and when druggists literally made up pills and powders by mixing ingredients. In 1897 Mr Hind offered “The Sulphonal Powders” (a sleeping medicine) and there were several others mentioned. I like this: Hind’s Nursery Hair Lotion. I couldn’t help buying the label above on ebay last week…Mr W T Hind has really caught my imagination. I am delighted to report that his great-granddaughter – herself a pharmacist – is willing to let me interview her about The Park pharmacy, and I will be sharing the results as soon as possible. Regards, Elizabeth. 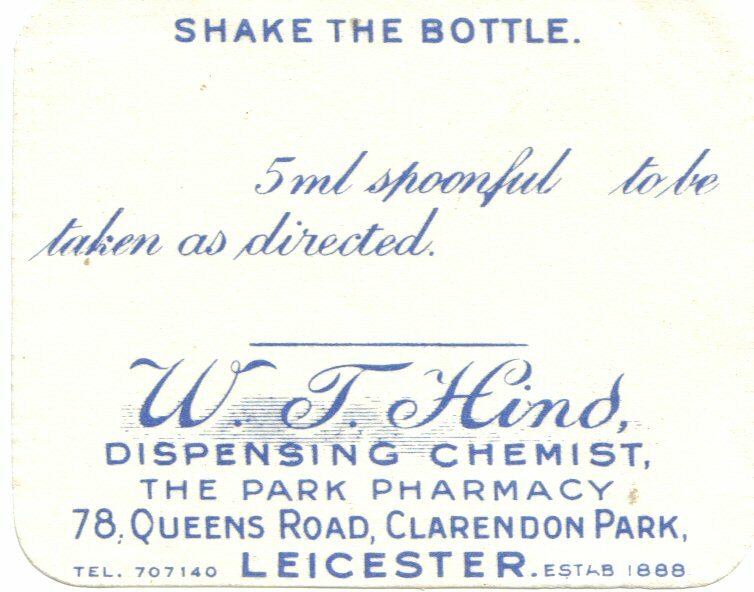 This entry was posted in Archives and tagged Chemists, Clarendon Park, Family history, Genealogy, House history, Leicester, Local history, Pharmacy, Victorians. Bookmark the permalink. Fascinating! I have never come across a surviving prescription book, sounds absolutely wonderful, what a wonderful resource for family historians it could be. Thanks John, I agree they are fascinating. When I have the time I am going to index all the clients. Every time I do a tiny bit of research into them, so many stories emerge…like Mrs Rattenbury’s baby and poor Thomas Pochin’s heart troubles. Mr Hind’s great-granddaughter has a good collection of Victorian bottles and photos of the shop, which I can’t wait to share. Good stuff. I seem to remember it was Mr Hind who sold the Pharmacy to the current owners. I would guess at about 12 years ago. Maybe longer.